Yet Hammer ran after him, throwing wads of cash at him, why wouldn't he do it...? Actually, from what I've read one of the reasons that Lee didn't want to do this film was that Hammer did not throw wads of cash at him, i.e. they didn't want to pay his going rate. Rather they "blackmailed" him into coming back by telling him how many people he would put out of a job if he didn't. Ouch. Not classy. not classy at all. Lee was the first Dracula I have seen, so I will associate that character with him. The three I saw were Dracula (a.k.a. Horror of Dracula), Prince of Darkness and Dracula, 1972A.D. and I still feel close to that experience now (the latter more of a guilt pleasure at this point). 'Black Eagle' takes as its inspiration Reagan-era cold war paranoia. 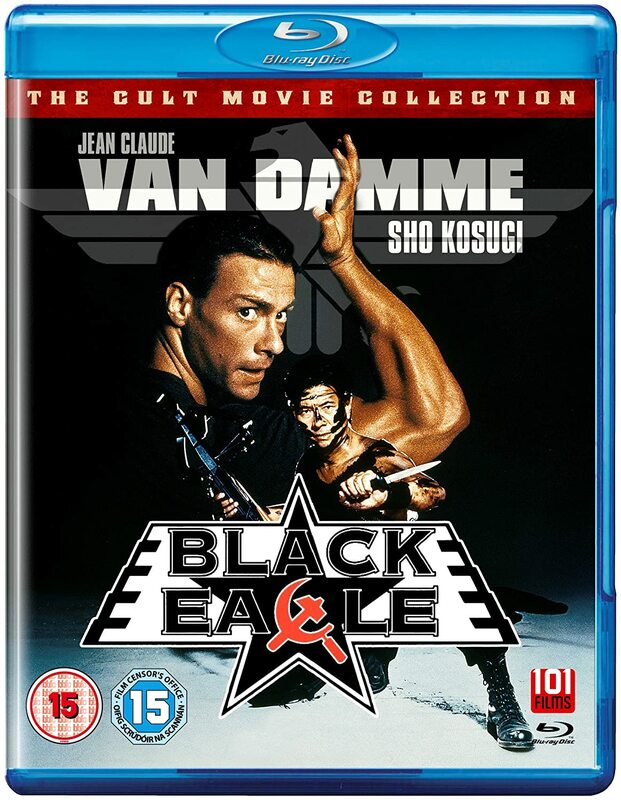 Jean-Claude Van Damme plays Andrei, a KGB operative and Shô Kosugi as CIA agent Ken Tani aka Black Eagle. This was Van Damme's second movie and helped to secure his reputation as one of the world's leading action heroes. After an F11 fighter plane gets shot down over the Mediterranean Sea, the U.S. Government cannot afford to lose the top-secret laser tracking device on board. But unfortunately, the KGB team lead by the infamous Andrei (Jean-Claude-Van-Damme - KICKBOXER) are beating the CIA in the race to find it. The CIA has no choice but to call in their best man, master martial artist Ken Tani (Shô Kosug - ENTER THE NINJAi), code name…Black Eagle. In response the KGB resorts to an all-out war, with the powerful Andrei matching Ken blow for blow. Bad news: This isn't a very good Jean-Claude Van Damme film. It's actually not a JCVD film. It's a Sho Kosugi film with JCVD in a rather minor role. Worse news: This is not a very good film, period. It's not terrible, it's just not terribly good. Good news: The Blu-ray release from 101 Films is absolutely flawless when it comes to image and sound quality. I'm pretty sure that this movie has never looked or sounded better, even in the cinema. If you're a JCVD completist (or, for that matter, a Sho Kosugi completist) you'll kick yourself if you're in the wrong region without a region free BD player. Or perhaps you'll get the German release, which seems to be region free, but I don't know anything about its quality. For the rest of you - this is a serviceable action movie, but no need to lose sleep over it if you decide to pass it by. An international team of scientists arrive on the remote, NATO-controlled Bear Island high up in the Arctic Circle. Their mission is to study the effects of global warming on the polar ice caps – or is it? 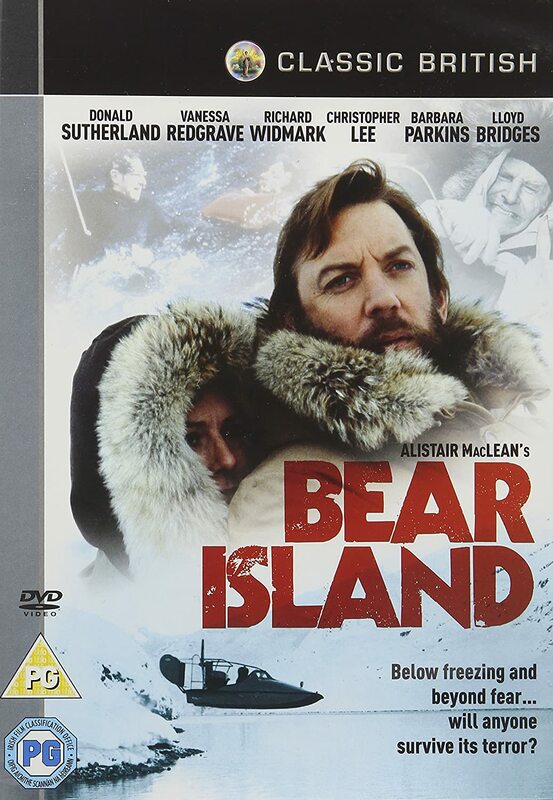 Beatifully filmed on location in Alaska and Canada, Bear Island is directed by Hammer Films stalwart Don Sharp (Rasputin: The Mad Monk, Kiss of The Vampire) and has never been available to own on UK DVD before. This new release has been extensively remastered and restored. At some point in my youth I must have read Bear Island, but I have absolutely no memory of it. I know that the movie is "loosely based on" the book. Can MacLean's writing be improved on? Certainly. Does this script do that? I doubt it, MacLean's book can't have been that bad! - What were those weather researchers actually supposed to be doing on Bear Island? We never saw any researching. - Why would NATO insist on radio silence from a research party? - If there was a NATO installation on the island, why was the research station so far from it? and also why does Bear Island in the movie look nothing like the real Bjørnøya? With a decent script, and possibly a better director, this could have been a cracking movie. Instead it's just a passable action movie. Not the worst of MacLean adaptations, but quite far from the best. Doctor Mordrid (JEFFREY COMBS) is the chosen guardian who can protect the Earth from eternal darkness; Kabal (BRIAN THOMPSON) is his vengeful enemy whose implacable wrath has escalated with time. Kabal has arrived on Earth and is planning to use his infinite powers to unleash a horde of hellish demons to devour and destroy humankind. I have seen Doctor Mordrid before, and I thought it was only so-so. I gave it 2.5 stars at the time. I probably wouldn't have double dipped for the blu-ray release if it wasn't for Dave Allen's stop motion animation. As a big fan of stop motion I wanted those sequences in HD. I don't know if it was just the better picture and sound quality, or if I was just in a better mood for it, but I liked the film a bit better this time. The mythology seems pretty muddled. 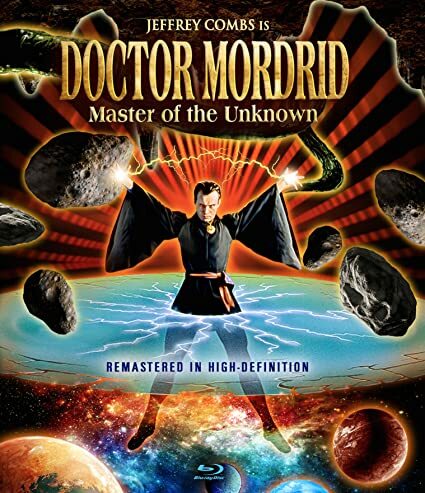 Apparently the script was originally an adaptation of Marvel's Doctor Strange, but Full Moon lost the rights to it, and changed it to Doctor Mordrid. Perhaps it would have made more sense to me if I had been familiar with Doctor Strange. It's an OK time-killer, but not a very good movie. But how many Full Moon movies are? 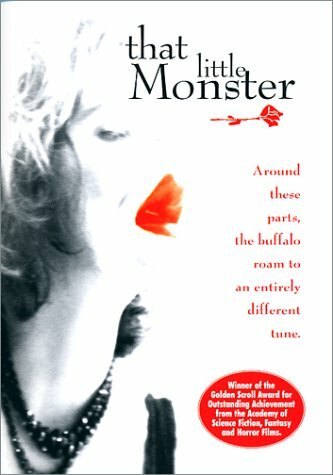 Like the unforgettable horror films of the past, THAT LITTLE MONSTER draws you into its world from frame one. In a dead-on recreation of Edward Van Sloan's prologue to the 1931 FRANKENSTEIN, sci-fi professor emeritus Forrest J. Ackerman steps before a curtain to forewarn us that the movie is not for the faint of heart. The screen blazes white and slowly refigures into two feminine hands in tight close up which pull away to reveal the face of a quite pretty young girl. Her name is Jamie (Melissa Baum). She's a foreign student, awaiting an interview with the parents of an infant boy she hopes to baby-sit. Everyday situation, to be sure. Ah, but nothing is ordinary here! At once the house and its bizarre appointments begin to close in on Jamie, unsettling her and creepily unnerving us. The photography pays homage to the great horror films of the 1930's. A devilish, strange, disquieting little chiller that will cap your evening with some delicious shudders. Some of its images may stay on in your mind to become part of your film vocabulary. Way too Lynch-ian for me, and I never really liked Lynch. The opening homage to Frankenstein by Forrest J Ackerman was brilliant, but really ill advised since it set totally wrong expectations for the rest of the film. Not my kind of film, at all. Before long, a stranger rolls into town with papers entitling him to legal ownership of Grey House. Cassie is left without a home and is convinced Middleton isn't where she belongs. Ultimately, everyone will learn holding on too tightly to something can make it more likely that thing will slip through your fingers. Sweet, inoffensive and just a bit too bland for my taste. But it has Catherine Bell, and I really like her. 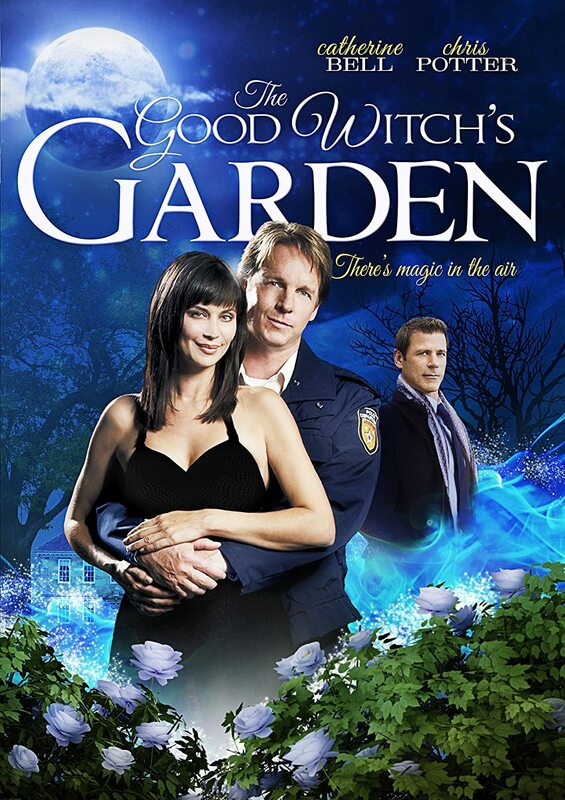 Not as good as the original Good Witch movie, but fair enough. Not sure I'll go for any of the following sequels, though. Long ago, when majestic fire-breathers soared through the skies, there lived a knight who would come face-to-face and heart-to-heart with the most remarkable creature that ever existed. Dennis Quaid stars with the voice of Academy Award winner Sean Connery in director Rob Cohen's heroic adventure that blazes with fantasy, humor, and the most amazing special effects. Bowen (Quaid) is a knight dedicated to The Old Code - a noble creed of honour. 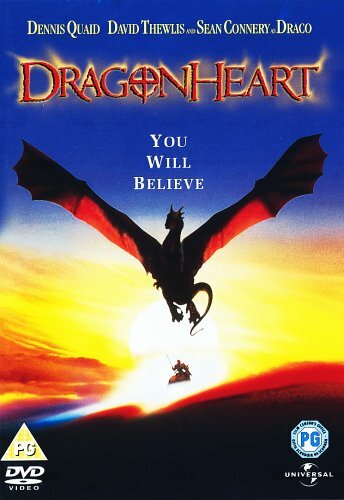 When his pupil,Prince Einon,becomes an even crueller king than his father,Bowen's idealism turns to bitterness.Believing Einon's soul to have been poisoned by a dragon,Bowen vows to destroy them all.On his quest for revenge he meets "Draco" (Connery),a dragon whose power,strenght and wit prove to be more than a match for the disillusioned knight.Soon,what begins as a life or death struggle between the two evolves into a friendship that will change the face of their medieval world. Co-starring David Thewlis, Pete Postlethwaite, Julie Christie and Dina Meyer, this epic adventure will move and thrill the entire family. I like the story. Or rather - I don't dislike the story. But the film has problems. And one of them - for me - is Sean Connery. In the documentary Rob Cohen says that Connery's voice is immediately recognizable, as if it's a good thing. It isn't. Not for me, at least. The 20 year old CGI is also "immediately recognizable". Combined, this means that Draco never becomes its own character, but is always an animated dragon with the voice of Sean Connery. And thus I can never really get involved in the story, and the tagline "You will believe" just never comes true. Billionaire HOWARD HUGHES produced and directed Hell's Angels, the most expensive film ever made of its time. Hughes spared no expense in capturing an exciting dogfight between R.A.F. and German fighter planes, using 137 pilots in all. Hell's Angels is perhaps more notable for introducing JEAN HARLOW to the screen in her first major film role. Set during World War I, Hell's Angels is the story of three Oxford buddies: two brothers (BEN LYON and JAMES HALL) and one German (JOHN DARROW). When all three are conscripted to fight on opposing sides of the war, each is torn between obedience to his country and that of his conscience. Jean Harlow is the woman who comes between the three men in this lavish period adventure. Hell's Angels is a remarkable film in many ways. For one thing, it was filmed twice. Howard Hughes had filmed it silent back in 1928. When sound equipment became available, Hughes scrapped the silent film and reshot it with sound. One sequence is shot in an early color process, and some other sequences are tinted. Also remarkable are the flying sequences. While there is some model work, most of the flying was done for real, and three pilots were killed during filming. The zeppelin is a model, but the crash looks very good. The story is interesting, but the film drags a bit in some sequences. Jean Harlow looks cute as hell. Hard to believe that she's still a teenager, though. She was 19 at the time. It's interesting that they had Rittmeister von Richthofen shoot down the brothers' plane. Unfortunately Snoopy was not there to save them. It's hard to rate this film without taking into account its historical value. You can't really compare it to modern films when it comes to story and acting. If you have no interest at all in film history, then this is possibly not the film for you. Otherwise, watch this and then watch Scorsese's The Aviator as sort of a docudrama making-of feature. A hideous creature kidnaps the woman he loves, forcing scientists to hunt him all the way back into the depths from where he came in this iconic horror film. In this provocative follow-up to the original, the Creature (John Agar) has been captured by scientists who will stop at nothing to uncover his secrets. Miserable in captivity, the Creature finds only one source of sympathy – a beautiful female researcher (Lori Nelson). Soon he escapes and kidnaps her, determined to take her to his underwater lair. Acting legend Clint Eastwood’s first screen appearance is among the surprises found in this clever sequel, directed by the original’s Jack Arnold. Once again, scientists underestimate the Creature (Jeff Morrow), this time in a failed surgical attempt to transform him from a mutant into a human. Being able to live on land is not enough to make the Creature comfortable with humans. Enraged, he turns his wrath on anyone who comes near as he desperately tries to return to the deep-water world where he truly belongs. Highlighted by the original's eerie underwater photography and distinctive makeup, the film is an enduring tribute to the series' inventive creators. First surfacing in 1954, the Creature From the Black Lagoon has been one of the most important and influential monsters of the silver screen. Featuring Ben Chapman, Julie Adams. Oscar-Winner Benicio Del Toro, Arthur Ross and more, Creature Feature: 60 Years of the Gill-Man tells the story of the era behind the creation and distribution of this classic genre film. Narrated by Keith David, Creature Feature covers all three films in the Universal trilogy, including a special segment on the “copycat creature films." Flash forward 60 years to see the impact it has had with fans and collectors. Written and produced by Sam Borowski and directed and produced by Matt Crick, this feature length documentary will take you on a journey down Monster Lane! So, I decided to rewatch all three Creature films plus the documentary. I wish I could have watched the first one in 3D, but unfortunately I don't have a 3D TV. And I have no plans to buy one. I would like to see some of the classic 50's 3D movies in 3D, but I have rather little interest in any of the recent ones. I did actually see Creature in anaglyph 3D on television many years ago, but that system was flawed, and I only had a 21 inch TV at the time, so the impact was not that great. However, even in 2D, Creature from the Black Lagoon is a great movie. It is definitely better than the sequels. No surprise there. But the sequels are fun, too. Ricou Browning plays the creature in the underwater sequences in all three films. The creature on land is played by a different actor in each film. I was hoping that the documentary would shed some light as to why that was, but no such luck. Apart from Browning I think the only actor that appears in more than one of the films is Nestor Paiva, who plays the captain of the boat that takes them to the lagoon. He is in Revenge as well. Creature from the Black Lagoon is available on blu-ray, either as part of the Universal Monsters boxset or separately. The sequels are only available on DVD in the Creature from the Black Lagoon Legacy Collection, as far as I know. Creature Feature: 60 Years of the Gill-Man is available on both BD and DVD. It has some interesting facts and interviews, but much of it concerns the Creature fandom and wasn't really very interesting, in my opinion. At around $20 it's not very good value for money, unless you are really into The Creature. I agree, the Creature films are great fun. I own the Legacy set (I actually own all of them, so also Frankenstein, Dracula, Invisible Man, Wolf Man and Mummy) as well as (the UK release of) the Blu-ray set of the main films (although for Frankenstein it includes Bride and it added Phantom of the Opera). In fact, when I was a kid I saw Jack Arnold's science fiction films on TV and liked them a lot. He was a great B-movie director of his time, with Tarantula, The Incredible Shrinking Man and more to his credit. 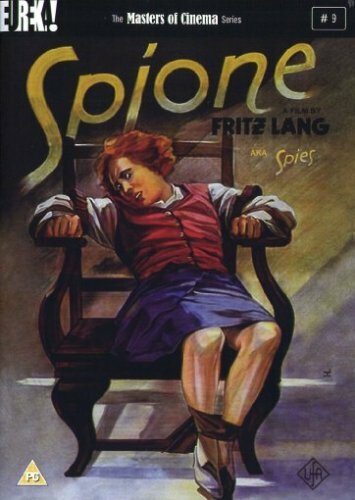 Newly restored to its original length, Fritz Lang's penultimate silent film, 'Spione [Spies]', is a flawlessly constructed labyrinthine spy thriller. Hugely influential, Lang's famous passion for meticulous detail combines with masterful storytelling and editing skills to form a relentless tale of intrigue, espionage, and blackmail. An international spy ring, headed by Haghi (Rudolf Klein-Rogge), uses technology, threats, and murder to obtain government secrets. As master spy, president of a bank, and music hall clown, Haghi leads several lives using instruments of modern technology to spearhead a mad rush for secrets — secrets that assert his power over others. Setting in stone for the first time many elements of the modern spy thriller, 'Spione' remains remarkably fresh and captivating over 75 years since its first release. Presented here with original German intertitles (and optional English subtitles), marvel as Lang carefully reveals the elaborate methods of the spies as they move through his unknown city - a mirror of troubled Weimar Germany. I'm normally not a real big fan of silent movies, and I find that I prefer movies that are about 1½ hours. So could a 2½ hour silent movie hold my attention. In this case, the answer is a resounding Yes. I wasn't really surprised, because I liked Dr. Mabuse - the Gambler as well, and that one is almost 4 hours. Fritz Lang really is a most remarkable director. Spies actually feels very much like a Dr. Mabuse film, if Mabuse had turned into a master spy instead of a master criminal. There are several versions of this film. The one I watched was the restored version released by Eureka. The US Kino release is essentially the same, except it has English intertitles, whereas Eureka has German intertitles with optional English subtitles. The story does have a few weak spots, but this movie is still well worth watching. Especially if you have any interest at all in film history. Un long dimanche de film... Well, I don't know if that's proper French, but I just wanted to say that the film was a little too long for my taste. I would have preferred a few less subplots. That would have made it easier for me to keep my interest up throughout the movie. There certainly are movies over 2 hours that never feel too long for me, but this didn't quite make the grade. That said, I thought the cinematography was fantastic. I like Audrey Tautou quiet a lot. It was quite a bit gorier than I had expected, given that it was on Yves' grandchildren's top lists. The story was fine, but I'm not really fond of that many flashbacks. I prefer a somewhat more linear storytelling. Still, not a bad movie at all. Well worth the time put in to watch it, as Pete likes to say. It was quite a bit gorier than I had expected, given that it was on Yves' grandchildren's top lists. Well, it was not a movie that I wanted to show them, but after they learned about WWI at school, and heard about Verdun's commemorations this year, they insisted to see a movie showing trench warfare. In fact, they were not really scared by the war scenes, but very interested by Mathilde's search for her lost fiance. But I was surprised to see this film on their lists.